Aston Martin's version of the iQ will be called the Cygnet. Luxury carmaker Aston Martin has forged an innovative alliance with Toyota to develop what could be the world's first luxury city car. Aston Martin on Monday released a photo of the Cygnet, which is a Toyota iQ with restyled front sheetmetal. Although officially billed a concept, reports in Britain say that Aston Martin will put the Cygnet on sale next year. At first, it will be offered to current Aston owners or those who have a car on order. But it will be offered to the public later. The price? About 23,000 euros. That's a step up from the iQ's base price, which is 12,700 euros in Germany. Aston says a key part of the Cygnet is a new grille design for the automaker. There also are slight changes to the shape of the headlamps, and the addition Aston's signature vents on the hood and front quarter panels. Aston won't make mechanical changes to the iQ. Toyota will build the cars and ship them to Aston's assembly plant in Gaydon, England. There, Aston will trim out the car's interior with leather. 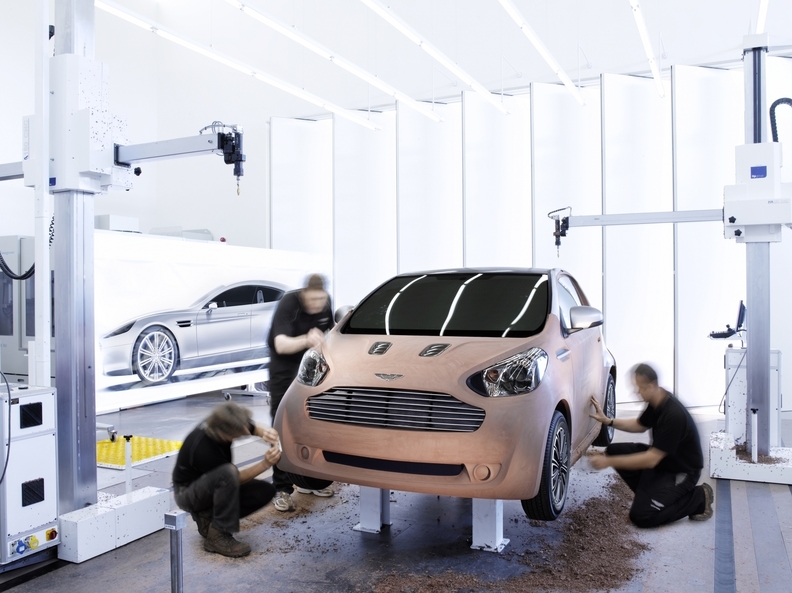 Reports say that Aston will build up to 2,000 copies of the Cygnet a year. One important note: The addition of the Cygnet to Aston's vehicle fleet will improve the automaker's emissions ratings. Toyota launched the iQ in Europe in January. Toyota launched the iQ in January. Toyota's revolutionary iQ platform is about to reset traditional thinking, with plans that the world's smallest four-seater will serve as the basis for a new luxury commuter car to be exclusively built for and sold to Aston Martin owners. Toyota Motor Europe (TME) today announced that the new “Cygnet” would pair Aston Martin's trademark design flair with the Toyota iQ's highly compact and low-CO2 city driving package. The commuter car will be tailored specifically to customer requirements at Aston Martin's global headquarters in Gaydon, the United Kingdom. ‘It's a great compliment that the Toyota iQ has been hand-picked by one of the world's most prestigious sports car brands, a company with whom we also share a strong friendship. This collaboration represents a natural pairing of strategies: a small yet spacious package, perfect for the city driver, finished off with Aston Martin's iconic design language,' said Tadashi Arashima, CEO and President of TME. ‘The Cygnet is a good choice for the Aston Martin owner looking for that second or third car, which is luxurious and eco-conscious,' he added. Although radically different in size and customer base, Aston Martin and Toyota are united in their corporate philosophies of delivering superior quality, engineering excellence and innovative technology. The collaboration is also fortunate to benefit from a strong relationship underlined by a passion for cars. The Toyota iQ is considered a breakthrough in intelligent design. Less than three metres in length, its flexible package can accommodate up to four people, providing owners with a new dimension of versatility. Featuring a range of design innovations - such as its flat under-floor fuel tank and asymmetric dashboard - the iQ is positioned as the “no compromise choice” with CO2 emissions starting as low as 99 g/km. It also offers outstanding levels of passive and active safety equipment resulting in a Euro NCAP 5-star rating. Despite tough market conditions for the automotive industry, the Toyota iQ has proved appealing to a wide variety of city drivers with a taste for style, driving performance and low CO2. 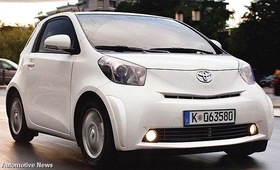 The Toyota iQ made its European sales debut in January 2009. It continues to perform in line with expectation, with over 25,000 units sold to-date. The planned collaboration with Aston Martin is a timely endorsement of the iQ's superior packaging. The announcement marks a critical step in Toyota's longer-term planning to expand the ‘iQ world' - that is, to bring new versions of the Toyota iQ to market globally and expand the company's eco-friendly line-up. Gaydon, Monday 29 June 2009. Aston Martin has developed a new luxury commuter concept; the ‘Cygnet' which will offer customers a distinctive, intelligent and exclusive solution for urban travel in style and luxury. The concept will offer Aston Martin trademark design in a commuter car package based on the critically acclaimed Toyota iQ with a Euro NCAP 5-star safety package. The ‘Cygnet' concept represents a creative, environmentally conscious solution, being small, yet with presence - and highly fuel efficient, now combined with the prestige of Aston Martin's luxury brand ownership. Aston Martin, the world leader in exclusive niche engineering is collaborating on this concept with Toyota the world leader in volume, quality and reliability. Although vastly different in size, Toyota and Aston Martin share the philosophy of engineering excellence and innovation underlined by a strong passion for cars.